Hello. It’s been a while since I posted, and although I regret that it’s been a while, there is a good reason. We’ve been super busy at work. And let me say, when you own your own business, busy is way preferable to not busy! We are having high sales this month. But the even better news is that we have been creating opportunities which could lead to ongoing increased sales. Some of these opportunities haven’t panned out yet, so I hope I’m not jinxing things by mentioning them! So, there are a number of factors contributing to us being able to create opportunities, but I just want to talk about the ones related to running. I started running several years ago. And one of the best things about running for me is that it makes me feel strong. I’m sure it’s the same for you. But once I realized I could run x number of miles, or race in a variety of distances, it made me see that I’m pretty strong. This gave me more confidence. I learned that I could do more than I thought. And the every day work problems lost significance . 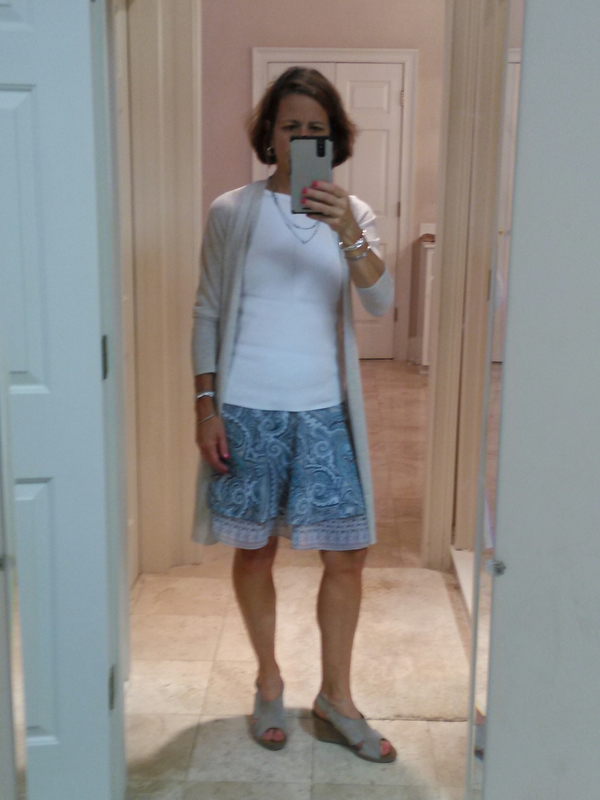 As my body transformed through running, I had to start buying new clothes. I’m too cheap to spend much on clothes. So for years, even though I was now in good shape, I didn’t dress nicely. Instead of dressing like the owner of my business, I dressed like the delivery lady. That all changed a few years ago when I got a second job at a women’s clothing store. Through working there, and helping ladies with their wardrobes, I began to see that dressing nicely is another way to build confidence. The fact that employees are entitled to shop at the “company store”, where everything is $5 or $10 helped me transform my wardrobe quickly and frugally. Now, when I go see our business customers or prospects, I’m not preoccupied with feelings of inadequacy. I know I look nice, so I can concentrate on building our business. Petty I know, but I’m convinced that dressing more nicely is helping me build our business. The other way that running is helping to build our business is through goal setting. I think all of us runners can easily appreciate the process of setting a goal – like running a marathon – and following the steps to achieve the goal. But as business owners, I’ve got to confess that we’d become a bit lazy about setting goals. Now I’m not going to say that we magically got more business because i wrote that sentence four times! 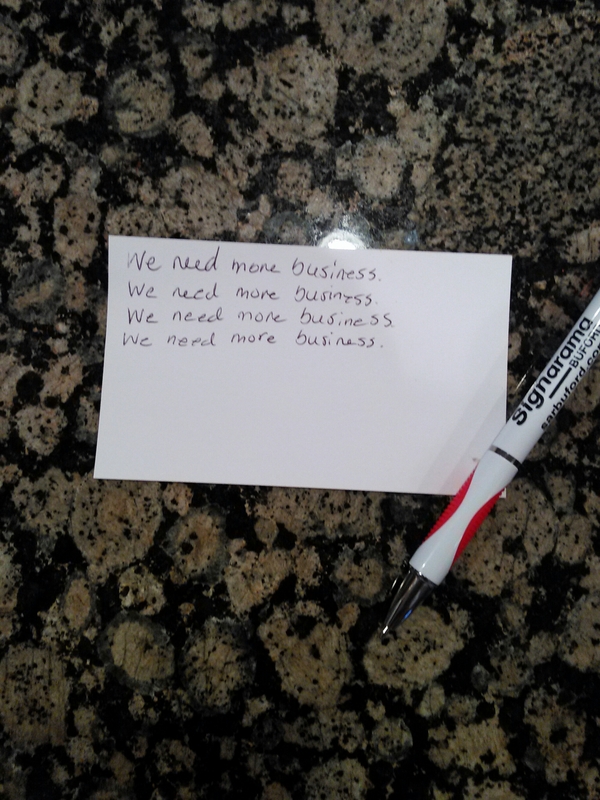 But I will say that actually writing those words made me focus on ways to go about getting more business. We strategized and came up with a real plan to help us get more sales. All this, thanks to running! This entry was posted in Uncategorized and tagged business, dressing nicely, goal setting, run, running, self confidence on August 24, 2016 by Rebecca Royy. Definitely good luck!! And I’m happy to hear you’ve been busy! I agree with everything you said above… and the clothes, totally agree! You have such a fabulous figure, I imagine you look good in most everything! Cheers to a booming business!! Love the notes about confidence. I’ll also add, that it’s a lot more fun to shop and get dressed when you feel good about your body! So true! But another thing I’ve learned from working at the clothing shop is that we are so hard on ourselves. Pleased you’re back. Good luck! I completely agree about the clothes and confidence. Running helps in so many ways. It does! Running has really improved my life! I always see parallels to running/planning my business and the running. Though I could use some new clothes 😀 you are definitely making a point there. Unfortunately that’s how it works … It’s the first impression. I think your point, that it makes YOU feel better and not worry is the key here though. If one feels good it shows.